Upholstery foam is often used for specialty costumes, puppets and other craft projects. Because the foam is flexible, painting it becomes an issue. Most paints will crack and flake off of a flexible surface over time. The solution to this problem is to mix in an adhesive, which binds the paint to the foam surface. The ideal combination is acrylic paint (which offers very strong colors) and an acrylic-based adhesive. These adhesives are available at special effects suppliers, and are often used for makeup applications. 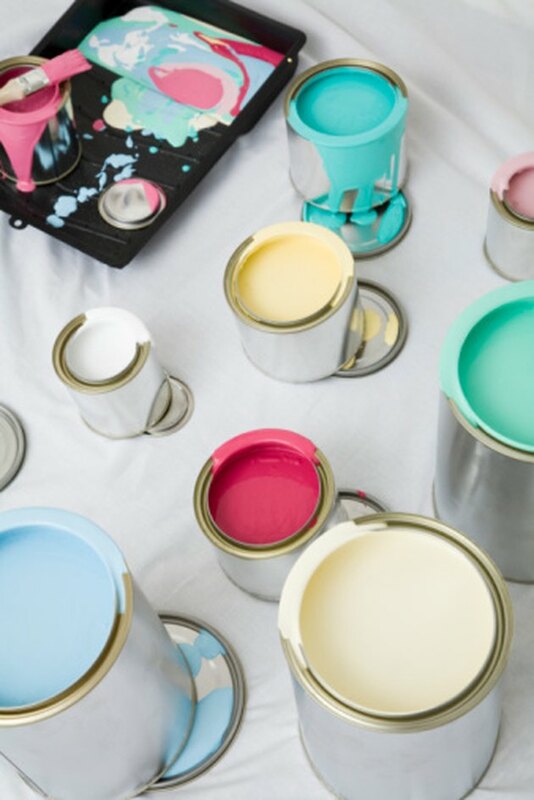 Paint upholstery foam with bright, vibrant colors. Mix acrylic paints in a small jar until you reach the color that you want. If you are using a color straight from the bottle, simply pour some of the paint into the jar. Mix an equal amount of acrylic-based adhesive to the paint. Measure it by eye; there is no need for specific measuring equipment. Mix the paint and adhesive with a craft stick. Brush or sponge the adhesive onto the upholstery foam. Allow it to dry. This process can be accelerated with a hair dryer if needed. Apply a second coat of paint if needed. Allow the second coat to dry. Mix additional colors of paint and adhesive as needed to complete the paint job. Powder the finished surface with color-free powder to eliminate any residual stickiness from the adhesive.